Each spring, Midwest Cheer and Dance puts on a cheer competition at Six Flags in San Antonio, Texas called Cheer Fest. 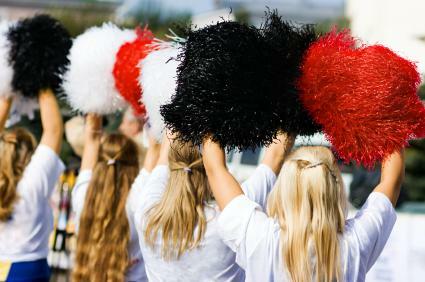 The competition includes a dance portion for dance teams or cheer squads who incorporate dance into their routines. The event is held in Lone Star Lil's Amphitheater. Lone Star Lil's Amphitheater has stadium-style seating and a large grass field. During Cheer Fest, a full-spring floor is laid out for the girls to compete on. The theater has been open since 1992. One of the advantages of the amphitheater-style seating arrangement is that there truly is not a bad seat. From anywhere in the stadium, you will have an excellent view of the competition. Cheer Fest is an exciting day for cheer squads and dance teams. There are competition for teams and individuals at the event. Coaches are only allowed to line up younger teams, such as mini-squads. Otherwise, the squads are on their own to show their true talent. Each coach should have a competition schedule prior to the event day, so you will know when your teams are due to perform as well as when individual performances might be. In general, registration starts at 9:00 a.m., warm-ups begin at 10:30 a.m. and team competition starts at 11:00 a.m. Once team awards are given out, individual competitions begin. First Place Team Award: The squad that takes first place in their division will receive a five-foot trophy. Each member of the first place squad will receive a medal. Second through Fifth Place Team Awards: The squads that come in second through fifth place will receive a plaque and each squad member will receive a ribbon. Individual Awards: Every individual competitor receives a trophy. Exhibition Team Awards: Each exhibition team is given a plaque and team members get a ribbon. How long you or your squad has to perform will depend upon which competition you enter. According to competition FAQ sheets on the Midwest Cheer and Dance website, there are some general guidelines. It is best to get the routine as close to the maximum time allowed as possible, but be careful not to go over as you may receive a penalty for going over the allotted time. You can get specific details on the ages each division encompasses on the Midwest Cheer and Dance website under info on individual routines. Coaches and individuals can register online at the Midwest Cheer and Dance website. Individual competitors should expect to pay between $75 to $100, which includes an all-day pass to the theme park. Spectators can purchase a ticket for $30 through the coach registering the event. This also gives the spectator an all-day pass to the amusement park. Cheer Fest is a fun event for the entire family, melding your passion for cheerleading with the fun of a day at the amusement park. For those who participate in a dance team, Six Flags Fiesta also hosts Dance Fest later in the spring.